This home is perfect for 2 families, with two tastefully decorated bedrooms for the adults, and the perfect bunk room for the kids. PLUS, it’s ok to bring the family dog! Three bedrooms with 5 beds provide comfortable sleeping for up to 8 people, plus the additional sofa sleeper for 1 more single, or couple. The gourmet kitchen is a chef’s dream, fully stocked with quality cooking gear, and you’ll always be part of the conversation with kitchen open to the family gathering area. The large dining table seats 10, plus there’s additional seating for 5 at the bar. The living room has plenty of space to gather around the fireplace and large flat screen TV, with comfy sofa, love seat and overstuffed chairs. The family room features a regulation pool table and sofa-sleeper. The kids will love the mini pinball machine. Step out the sliding door to the deck, BBQ, large hot tub, and beautiful park-like back yard with inviting seating areas for dining or lounging. All the bedrooms are upstairs providing a nice escape from the activity downstairs. Each bedroom has its own flat-screen HDTV and satellite stations. The master suite features a king size bed and private bathroom with two sinks and your own soaking tub and walk-in shower. The “Fishing” room is decorated for the fisherman in the group, but don’t borrow the rod on the wall! This room features a queen size bed and shares the newly remodeled bath in the hallway. The “Bunk Room” is ideal for the kids with a single/single bunk bed plus a full-sized bed. A new and immaculate bathroom with two sinks and luxurious walk-in shower is at the top of the stairs shared by the two bedrooms. The 1/2 bathroom complete with washer and dryer is downstairs next to the kitchen. There are two bikes with helmets and assorted snow toys for guest use. The home is surrounded by trees in beautiful a neighborhood, but you will feel like you are in a secluded mountain retreat. You are just two hundred yards from miles of trails for hiking, biking, or snowshoe. Skiing is 4 miles to Heavenly Resort and 12 miles to Sierra at Tahoe. Rent an SUP or Kayak at Lakeview Commons, a beautiful beach just 3 miles down the hill. As for the night life; Harrah’s, Harvey’s, Mont Bleu and now the Hard Rock Casino are all just 4 miles away. Try your luck at the game tables or slots or catch a great musical act. South Lake Tahoe is a great draw for some of the biggest names in entertainment. Early Snow = Early Ski Season! 2015 is shaping up to be a great year for hitting the hills in Tahoe. Several Lake Tahoe Ski areas opened earlier than usual, with opening day being last weekend. As every weekend approaches, it seems like the weather gods are bringing flurries of snow, and it’s not slowing down. With an already 13-18 inches of snow reported, the weather forecast predicts that another storm is just six days away and will last for three full days. This means 1-3 feet of snow covering the Lake Tahoe area. This is the most snow the Lake Tahoe area has since in three years. meaning locals need to prep for the winter and vacationers must start planning! Book your trip and stay with RnR Vacation Rentals from nightly visits to ski leases, RnR Vacation Rentals has the perfect home for your stay. RnR homes are fully equipped with entertainment like hot tubs, pool tables, big screen TVs and more. With a wide variety of pet-friendly homes that can host the whole family or a cozy place to hunker down by the ski hill. And while you’re planning your trip up to Tahoe, check out these ski hill improvements and events happening around the lake. Most resorts are in full swing so don’t miss out! Stay in one of Tahoe’s most carefully maintained homes. Comfortable 3 BR, 2 BA Tahoe cabin, ideal for one or two families. Doris’ Place at Tahoe gives you that Tahoe Cabin feel, surrounded by trees with quick access to the mountain and lake. In addition, it’s a quick 3-5 minutes from everything you love about Tahoe. The beach at Lakeview Commons, Heavenly Ski Area, the Casinos, and dozens of great restaurants. This cabin features a fantastic layout for families to enjoy time together or time on their own. You will love the ground floor living with 2 bedrooms a full bath and the main gathering area that connects the kitchen, dining room, and spacious living room. The warmth of a wood burning stove combined with the entertainment of a 50” HDTV will provide you the best of today with the traditional comfort of a mountain home. The upstairs features a large family room that is ideal for fun and games or a quiet retreat. Plenty of comfortable seating for watching the large screen HDTV, or competing on the deluxe air hockey table. With a large bedroom, walk-in closet, and full bathroom, the upstairs is a great suite for the kids or family. For outdoor activity, you can head out the back or front door. Right off the kitchen/dining room you will find comfortable west facing back yard with large deck for dining, barbecuing on the new gas grill, or just catching some sun while reading a book. Plenty of room to create a snow man too! Need more space? Cross the street to enter the National forest trail system for a leisurely stroll or serious hiking, biking, snow shoeing, and X-Country skiing. You can store your toys in the two-car garage too. Winter has arrived! 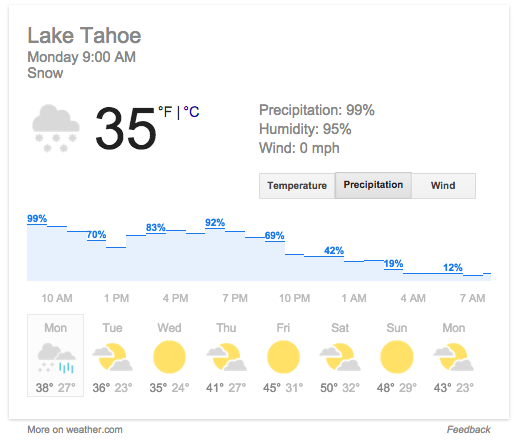 With storms, cold fronts, and El Nino; it’s inevitable that ski season in Tahoe is going to be excellent this year. Whether you frequent the black diamonds or hop on the bunny hill, staying nimble and in shape will help prevent injuries this winter. 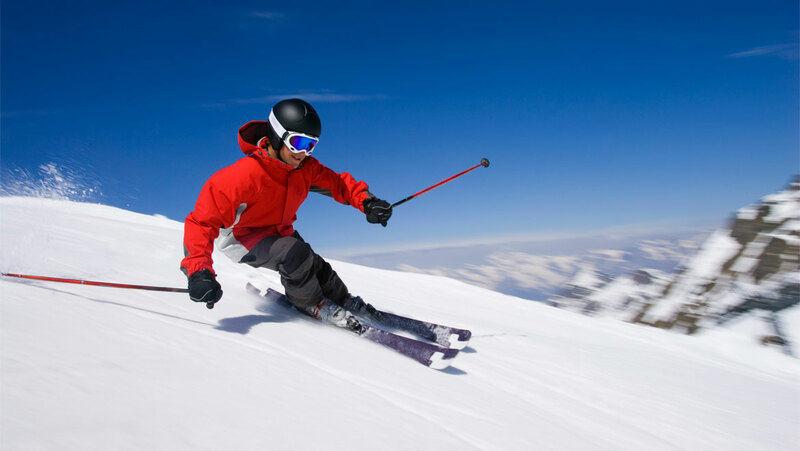 Studies show that roughly three in 1,000 ski days will include a knee injury. Of those, one in three is ACL related. That means on a typical resort day — with somewhere around 15 to 17,000 ski visits — as many as 17 skiers’ seasons could potentially come to an end with ACL injuries. 1. SINGLE LEG TOE TOUCH: From a standing position lift one leg back. Flex the knee on the other leg while reaching to touch your toe. When standing on your right leg reach toward your toe with your left hand and vice versa. 2. THE WALL SIT: The goal of this exercise is to create a seated position without a chair by leaning up against a wall. With legs apart and back against a wall, try dropping to a seated position. This exercise can be done with varying degrees of difficulty. Those less conditioned to the position may want to start with a not fully seated position and gradually work toward it. Hold the position as long as you can and gradually add time with future repetitions. You should be able to lift your toes while holding the position. This exercise is good for quads, hamstrings and endurance. 3. LEG LUNGES: From a standing position drop forward into a lunge position — one leg flexed with the knee close to a 90-degree angle and the other leg back. Unlike the above single-leg toe touch, arms should be at one’s side and both feet should be touching the ground — one flat-footed, the other with toes pointed backwards. 4. SINGLE LEG BALANCE: To help build balance skills, it’s good to work on standing on one leg, slightly flexed — with the other leg slightly behind. To add challenge to this exercise, close your eyes, or add in other motions. This can be done while doing other household activities. 5. THE BRIDGE: For additional strength building and core conditioning, start by laying down on your back with both feet planted flat on the floor. Then thrust your hips into air so that only feet and shoulders are touching the ground. Hold the position for as long as you can and repeat. Building core muscles helps with ski endurance. 6. SQUAT JUMPS: For building strength for mogul skiing and jumping, consider squat jumps. Vandehurst recommended this as more of an advanced exercise not necessarily geared toward all ability levels. With both feet apart and flat on the floor, flex into a squat position and jump. Try to land on your toes. Vandehurst said to repeat the exercise while maintaining consistent jump height. Jumps can either be straight up and down, forward or backward. To add challenge, include things to jump over or onto. This will help build leg strength. A winter weather advisory will be in effect for the greater Truckee-Tahoe region from 10 p.m. Sunday to 4 p.m. Monday, according to the National Weather Service in Reno. The forecast is an upgrade from what NWS reported Saturday when it suggested only a “few inches of snow” was possible. As is the case with most Sierra storms, conditions will make driving a challenge. Snow tire or chain restrictions will likely be in effect along most highways and passes, including Interstate 80, U.S. Highway 50, California highways 28, 89 and 267, and Nevada highways 28, 207 and 431. Follow TahoeDailyTribune.com all winter long for storm updates. What are you waiting for? Book your winter vacation home with RnR vacation Rentals today!